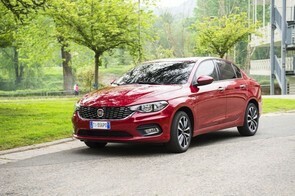 Fiat's new Tipo Sedan will be available to order from January 1st, rounding out the range that also includes hatchback and compact estate models. Like those versions, it's priced very competitively within the popular C-segment family car market, and comes with a lot of equipment as standard. Fiat is claiming class leading boot space with its 520-litre capacity. The entry-level Pop trim nets you air conditioning, electric windows and mirrors all round, six airbags and USB and Bluetooth connectivity with steering wheel-mounted controls. Engine choices for the Pop are a 1.4-litre petrol and 1.3-litre MultiJet diesel, both with 95hp and coming in at €16,745 and €18,495 respectively. Fiat quotes CO2 emissions as low as 98g/km and fuel consumption of 3.7 litres/100km on the MultiJet engine. The Easy adds leather on the steering wheel and gear knob, 16-inch alloys, front fog lights, rear parking sensors and cruise control, along with a five-inch touchscreen infotainment system inside. Petrol or diesel 1.6-litre engines can be specified alongside the smaller powerplants, with a six-speed automatic being the only gearbox choice on the 110hp petrol unit. Handily, customers can specify the Easy trim level for no extra cost over the Pop until the end of March. Topping out the offerings is the Tipo Sedan Lounge, which has 17-inch alloys, automatic lights and wipers, some chrome tinsel and satellite navigation among other improvements. This rounds out the range at €20,995, so it's certainly a good proposition in terms of value for money.